Fibre gathering lots of fun! We were a small by happy group who met at Mrs. Nicholson Home on a rainy last Saturday but we happily knitted, embroidered, sewed and hooked for a few hours together. Rachael, Tammy, Céleste and myself were joined by a young lady in Town for a visit who just happened to see our sign and also have her knitting with her. 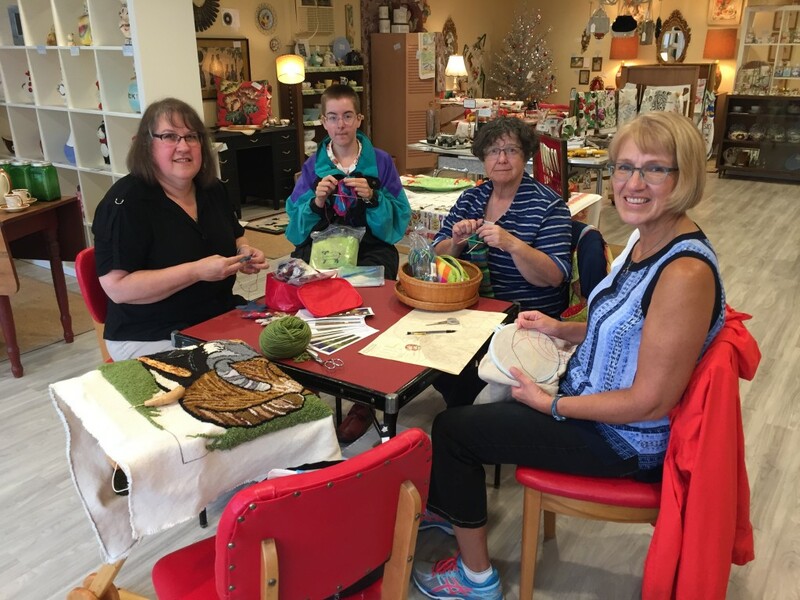 We look forward to seeing more members out at our stitching gatherings. Tammy, a young knitter, Céleste and Rachael on August 19th. All are invited to participate in some Fibre Fun in the courtyard of Mrs. Nicholson Home at 212 Saint-George Street in Annapolis Royal this coming Saturday, August 19th between 1 and 4 pm. Enjoy the wonderful Farmers and Traders market (8 am till 1 pm) and then come on over with your current project to work on or show off. Whatever you are working on, we would love to see it! Spend some time with like-minded fibrephiles and share ideas and inspiration. Please bring a chair, a hat and perhaps some sunscreen. The event will happen rain or shine as there is some room in the shop to stitch.